What's Wrong With the NFL Rules Regarding What Constitutes a Catch? Bryant clearly has possession of the ball here and is in the process of making a 'football move'. If you watch the play, very few will deny that Dez initially caught and had control of the ball. With the ball securely in hand, he took a step, took another step, then lunged, ball stretched out ahead, reaching to try to break the plain of the end zone with the ball. When the ball then hits the ground it comes loose from his hand, but he never actually lost possession of the ball. He re-secured the ball in the bend of his arm. He never actually dropped it, even when he lost control. Yet, Head Referree Gene Steratore, said he dropped it. This was with the benefit of actually being able to watch it all play out in super slow motion. In fact, the referree on the field who watched it happen in real time ruled it a catch. It's only after Steratore watched the footage in slow motion that he deemed it an incomplete pass. It's late in the 4th quarter. Dallas is down five points, 26 to 21. There's just four minutes left in the game. Dallas has the ball and the down is 4th and 2. If Dallas doesn't complete a play of 2 yards or more then Green Bay gets the ball back with four minutes left, where they don't need to score, they just need to protect their five point lead. Rather than simply trying to run the ball or complete a short pass on 4th down, the Cowboys go all out. They go for a 40 yard pass to Dez Bryant. 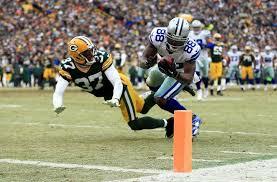 Dez, being the incredible athlete he is, does what he has to do to go up and get that ball. He makes an incredible catch that should have put the Cowboys in control of the game. Because he should have been ruled down inside the 1 yard line, the Cowboys could have taken their time, running as much time off of the clock as they could, before they scored. This would have left the Packers very little time to run back down the field to then have to score a field goal to win. So, yes, this call most likely changed the outcome of the game. The Dallas Cowboys should have won this game. They were the better team that day. Rule 8, Section 1, Article 3, Item 1 reads: "If a player goes to the ground in the act of catching a pass (with or without contact by an opponent), he must maintain control of the ball throughout the process of contacting the ground, whether in the field of play or the end zone. If he loses control of the ball, and the ball touches the ground before he regains control, the pass is incomplete. If he regains control prior to the ball touching the ground, the pass is complete." I keep hearing analysts defend this call as the right call. And in doing so they keep siting the rule being followed to the letter. So let's assess this play in light of the wording of the rule. It begins with "If a player goes to the ground in the act of catching a pass...", and already there's a problem. By the time we get to the point in question where the ball hit the ground and came loose, Dez was no longer "in the act of catching the pass". If Dez was able to take two steps and then lunge forward with the ball stretched out, then he is no longer in the process of catching the pass. The pass is already caught. So none of the rest of the rule even applies. We're no longer assessing a situation that applies directly to this rule because he was no longer in the act of catching the pass. It's really that simple. If Dez had caught the ball in the same way, then took two steps in the same way, only going out of bounds instead of into the end zone, then those two steps along with control of the ball would have been enough to award him possession. So why is that not enough in this case? If this call was correct according to the rule, then the rules are inconsistent in what constitutes possession. When this call was first announced I felt physically sick. Now, full disclosure, I'm a Cowboys fan. But I can honestly say that even if the tables were turned and this was a Packer catch that was reversed in the Cowboys favor, I'd still agree that it was a catch. Even to the detriment of my preferred team. Why? Because it's honest and it's the right thing to do. To recognize the skill and the fact that a player made a legitimate play within the bounds of the rules when the play needed to be made. That's what the game is all about. Moments just like that. What I think made me most sick about this call was that Tony Romo made a clutch throw, and Dez Bryant made a clutch catch, during a risky 4th and 2 play, they both did what they had to do to take control and win that game. Not only do I think Dez deserves the credit for making an incredible catch, but with all of the criticism that Romo has taken for not being able to deliver in the playoffs, he probably needed this more than Dez. Now history is going to show Romo falling short yet again, rather than acknowledging the incredible game he had that day. Not only that, but this year's Cowboys team deserved their playoff run this year. It's a difficult thing to put a team together, made up of 60+ players and coaches, that has the right chemistry, the right skill, and the right attitude to have such a successful season. This year's Cowboys won 13 of the 16 games they played. Not just that but in more than one of those games they found themselves down by multiple touchdowns, only to fight their way back into the game and find a way to win it. This was a legitimately good team this year that got robbed of their playoff run by an ambiguous rule and a logic-defying call. And Tony Romo had a legitimately strong year, and play-off run, that should have been enough to silence his critics. Instead, it ended like this. Not to mention, whenever Aaron Rodgers was asked at the end of the game his opinion, and he sided with the ref's call, and every NFL spokesperson who has continued to side with the referree in this call, they have all lost some of my respect. Which in the case of Rodgers is unfortunate, because I respect him as a quarterback and competitor. If you have any respect for the game you are playing, if you have any respect for your fellow athletes, then the right call is to acknowledge what's really right in this situation. What's really right is that the Dallas Cowboys completed a risky play in a clutch moment when it really mattered, and should have won that game. Instead, the history books will show this year's team as losers, and that's wrong. Holy flying torpedo turds! I watch the video several times and, without a shadow of doubt, the guy obviously caught the freaking ball! OMG! What can I say, life is dangerous. You can be permanently injured or even killed walking your dog. There are a ton of rules in place to protect players from injuries like you're speaking of, but such is life that sometimes bad things happen. perhaps this Hub is not the proper place for me to bring up all this esoteric stuff. I just got a bit of a jolt when I realized that you follow football. I know a lot of Christians who like a bit of "rough stuff" on the field. I also know of many football players who are now in wheelchairs. The spiritual aspect I feel is quite separate. The violent fighting behavior is programmed into our physical selves. You can override this, but I don't find it a bad thing to exercise these tendencies through sport. There are rules that support mutual respect and safety. It teaches respect and fair play. It's a simplistic view to only see the violence and not see the sportsmanship. The spiritual explanation does not admit an end. The atheist view might. I think selfless love and compassion are the far greater motivator than brute violence disguised as sport. Sport is competive exercise for health and character building. Violent hyper competitive impulses have no good at all to offer humanity but quite the opposite. Such impulses are the root of war. I have nothing against sport itself as a healthy exercise. It should be based on love not ego and hyper violence. Love of health and actual sportsmanship. I think we can be certain the end of the human race is inevitable. We know the universe will have an eventual end. This planet will end. We, by nature, have an expiration date. There is no surviving this life. For us to be as we are now, able to live for decades, that's the result of humanity finding the strength and the fight within themselves to overcome obstacles and persevere. That's that same fight that's on display in a cage or on a hockey rink or a football field. We're tapping into that inner strength within ourselves. I think we as humans like to see the top athletes of this world dip into that well of inner strength and overcome. I think that's why we create sports that create those kinds of situations. It's inspiring. To know that what they're tapping into we too have within us. We know we have it because we're here. It may not be exactly the same as survival to fight in a cage match, but it's definitely tapping into that same inner strength. They're at least on the same plane. by religious leader I mean JC, Buddha, Gandhi etc. If it turns out not to be the direction that humanity heads to, then we can be certain the end of the human race is also a certainty. Fighting for survival is not the same as fighting in a caged blood sport for glory. Forgive me for not giving any more consideration to one who may be a 'prominent religious leader', but being billed as such means nothing to me. That gives them no more insight into the progression of the human psyche than anyone else. They have no deeper insights than anyone else. I think it's no more than a pipe dream to think this will somehow just go away. The entirety of the physical world is made of those who fought to still be here. If they didn't, they're no longer represented in the current population. Those of us who are here come from lines who were able to fight for themselves. Only the strong survived. And that's not just going to go away. It's all fine and good that we can have these logical discussions and find more amicable ways to deal with disagreements and such. But the fact remains, take away a persons daily needs or means to acquire it, make a person desperate enough, and violence is right back on the surface. That's how we survived. many prominent religious leaders see these things as being passe in the evolution of consciousness. Yes they may linger and yes they may even become stronger but in theory these things are meant to pass away and humanity is meant to reach a higher state. There will always be bloodsports. Cage fights and such. It's our nature. We can't just act like it isn't there. It most definitely is. We come from millions of years of fighting to survive. You can't just get rid of that. You could be right. I would like to believe that such sports will one day be played just for exercise and fun but instead we are seeing new blood sports being fought in cages. You don't know what you're missing. Football is the single greatest sport ever invented. Yeah, it can be aggressive. But humanity needs aggression. We need an outlet for it in some way. We can't deny this in ourselves. Just as the Romans used to do in the coliseums. Football is a great outlet for that aggressive nature in us. Without it it would still come out of us, just in worse ways. Maybe that's it. I have no interest in football. Sport can be too aggressive these days. Thank you, Oz, for thinking enough of me that you would consider anything beneath me. I have been a long time football fan and this call in this game affected me on an emotional level I can't even hardly explain. I know my wife was tired of hearing about it almost immediately. I had to get my feelings on the topic out. I would love any NFL representative or official to take the argument I made and maintain their stance that the call was right. I would challenge anyone. This hub may not have the same level of significance or importance as the type of topics I generally write about, but it was something I felt strongly enough about to feel the need to write about it. What can I say, I'm a nuanced individual. Although I deeply respect your spiritual ideas I don't think this particular hub has merit. Frankly it seems a little beneath you.